IMPORTANT. Ownership of Türkenkrieg is required to use this module. 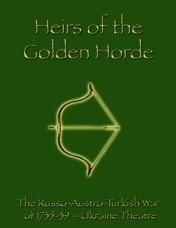 Heirs of the Golden Horde Second Edition (HGH) is the sixth volume of Red Sash Games Lace Wars series. The game is companion to Volume V, Türkenkrieg. The subject of both games is the little known Russo-Austro-Turkish War of 1735-39. Türkenkrieg dealt with the war between the Imperials (the Habsburg Austrian Empire) and the Ottoman Empire along the Danube. HGH investigates the theatre of the Ukraine, where the Russians attempted to destroy the power of the Crimean Tatars as a first step toward Peter the Great's dream of a warm water port. On the Danube, the Ottoman Turks dealt a critical blow to Charles VI and the House of Habsburg, leading almost immediately to the War of the Austrian Succession (1740-48). In the Ukraine, things were different. Forgotten or dismissed as "futile" by historians, the campaigns of the Muscovites against the remnants of the Mongols' Golden Horde were in fact brutally effective. Year after year, expeditions were sent into the Crimea to lay the Tatar Khan's homeland to waste - expeditions from which the once fertile peninsula never fully recovered. In the Kuban, the Russians unleashed their allies, the Turcoman Kalmyks and the Kabardians of the Caucasus, in a genocidal campaign against the khan's subjects in that Eden-esque region. The Ottomans held many forts around the rim of the Black Sea, mainly controlling the river mouths and all the trade that passed down them; these were besieged and taken by the Russians, partly as bargaining chips, partly as potential naval bases, and always to show the Tatars that their ally was powerless to help them.. In the last year of the war, Moldavia, a protectorate of the Ottoman Empire and the breadbasket of Istanbul, was overrun by the Muscovite juggernaut. Only the Austrians' "abject" surrender to the Turk in 1739 halted the steamroller. It is because the Russians were forced to hand everything back that the war is generally deemed "useless". Nevertheless the balance of power had forever tilted in their favour. The Russian Army had learned that it could beat the Turks with consistency. An attempt by Sweden to profit from Russian "exhaustion", mirroring Frederick the Great's war against the Habsburgs, only resulted in the loss of Finland to the Bear. The Ottomans went on to suffer a major internal revolt, further weakening them against any future encounters. The Tatars, who for centuries had levied tribute from their Russian "clients" and harvested millions of Slavs to sell in the Black Sea slave marts, were now in many places under the yoke themselves. In the next war, their khan would be forced to switch allegiance from Istanbul to St. Petersburg as a prelude to his people's political extinction. HGH allows you to explore the war on the Steppe. There are also campaign scenarios for up to 4 players that combine the Balkan and Ukrainian fronts; you play as teams, but with an eye to your own agenda. 1) Three map sections representing the lands of the southern Ukraine from the Carpathians to the Kuban. Scale is 8.5 miles per hex (roughly 4 leagues per hex). 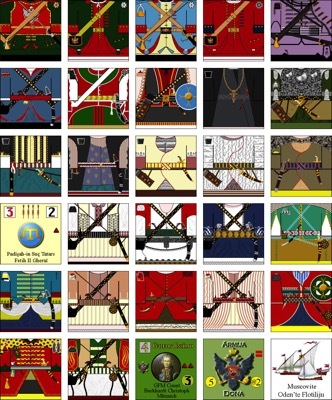 2) 1320 die cut counters representing the forces of Muscovy (Russia), allied Cossack Hosts, the Calmucks, the Kabardians, various Tatar Hordes under the authority of the Khan of the Crimean Tatars, Ottoman Janissaries and Sipahis, elements of the Asiatic provinces of the Ottoman Empire, Moldavians, Kurds, Mamelukes, and Poles. Scale is Battalion - that is, the playing pieces represent battalions and regiments or forces of an equivalent size.